There’s no shortage of beer innovation in San Diego – it goes on all year long – but the holiday season always provides an extra-special inspiration for many brewers. All over the county, brewery tasting rooms are tapping small-batch and specialty brews that were created especially to bring extra holiday cheer to craft beer fans. Given their limited quantities of holiday brews, most of the medium and small brewers in town will restrict their special releases to their tasting rooms. In some cases, very limited bottlings will be available, but – again – mostly at the brewery location. If you’re in the holiday spirit – or want to get some holiday spirits – I encourage you to check your favorite breweries online (or use TapHunter or similar apps) to see what’s being offered and when. Then head out and get to those tasting rooms, as specialty beers from good brewers never last long. 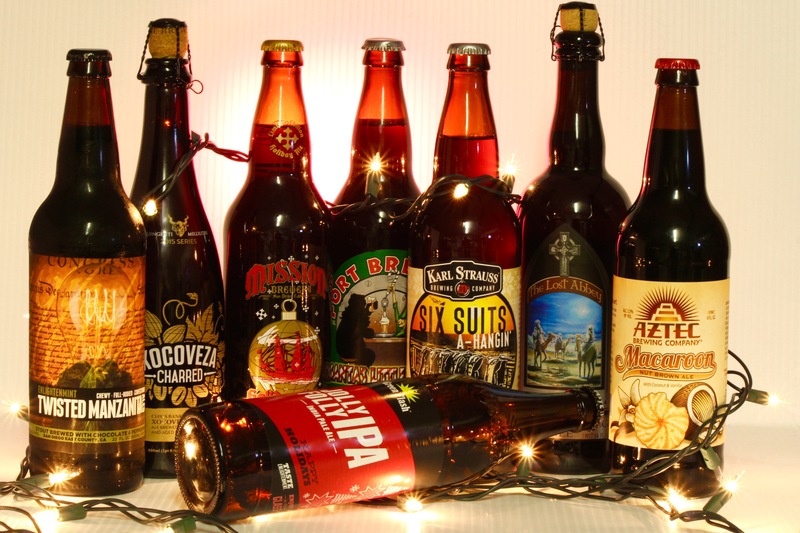 Here’s a round-up of holiday beers I was able to preview. In addition to tasting notes, I’ve also included some thoughts about pairings. After all, with all those pecan pies, Christmas cookies, and buche de noels around the house, you’ll want a few beverages to help wash them down. Besides, who needs more eggnog, anyway?! This Imperial Belgian-style brown ale is a dark, rich, full-bodied brew that has been aged in French oak. It has aromas of freshly baked bread and spices, and has flavors of molasses, caramel, nuts, peppery spice, with a hint of tropical bubble gum. This beer paired very well with apple pie and pumpkin pie, but was an absolute knockout with orange bourbon pecan pie. Holidays are for hop-heads, too! Even though most holiday releases tend to be heavier, more malt-driven styles, there are a few beers out there for hop lovers as well. This IPA is bold, West-coast-style hoppy brew with major aromas of pine (Christmas tree!) and freshly cut grass. With a medium mouthfeel, this beer delivers crisp, piny hop flavors with a hint of honey and pleasingly bitter finish. We paired this with a spicy chili, which was wonderful, but other spicy or highly seasoned stews or soups would fare equally well. > Find out more about Green Flash Brewing Co.
How about a Mexican hot chocolate for the holidays? Well, Stone has brewed the beer version. This thick and rich mocha stout is brewed with cocoa, coffee, cinnamon, nutmeg, vanilla, and Pasilla peppers, all of which waft from the glass as soon as it’s poured. Dark chocolate, coffee, and cinnamon are predominant flavors, along with notes of vanilla, smoky pepper, and nutmeg. Stone has released a few variations of this beer, including an extra-special “charred” version, which has been aged in bourbon barrels. Perfect pairings include chocolate, pecan pie, almond cookies, and roasted nuts, but this is one you can also simply sip by itself in front of the fire pit. > Find out more about Stone Brewing Co. This Belgian-style dark ale smells of raisins, candied fruit, figs, plums, and the characteristic “breadiness” of the Belgian yeast. The beer tastes of molasses, raisins, and candied fruit, with a light spiciness. Best pairings include cherry pie, chocolate cookies, and candied nuts. According to their web site, this rich golden ale is brewed with a small amount of Myrrh (an herb) and is bittered with the help of Frankincense (for some reason they left out the gold!). On the nose, this beer smells of caramel, honey, and raisins and has flavors of caramel, raisins, and pecans, along with a pleasing spiciness, a light funk from the Brettanomyces yeast, and crisp hop bitterness. Pumpkin cake and almond biscotti were equally perfect pairings with this beer, but this gem would also surely enhance any fruitcake. This imperial stout is a perfect example of its style. Rich aromas of chocolate, coffee, and caramel come out of the glass, backed up by plenty of chocolate, coffee, and caramel flavors in your mouth. If you want to turbo-charge your stout experience, Port also offers a bourbon-barrel-aged version of this beer, which has all the deliciousness of the base stout with the added decadence of bourbon notes. Chocolate covered espresso beans and chocolate covered walnuts were seamless pairings for this brew, as would be any kind of chocolate cake or mocha dessert, such as Tiramisu. Ever wonder what a beer equivalent of a Mounds bar would be? Well, wonder no longer. Aztec’s special end-of-year release has big coconut on nose and an intense coconut flavor. It’s a brown, so it has a lighter mouthfeel and body than a stout, along with a lighter maltiness. Pair this with chocolate cookies, chocolate covered walnuts, or – yes! – even a Mounds bar. Here’s what you’d get if you dropped your candy cane into your beer glass and waited for it to dissolve…This Santee brewery usually creates their peppermint-infused chocolate stout just in time for the holidays. The beer has strong aromas of eucalyptus and peppermint, with candy cane flavors that are supported by a light maltiness, a light mouthfeel, and hints of dark chocolate. Pair this with dark chocolate truffles, chocolate pastry/cookies, cheesecake, or vanilla ice cream.